PONTIAC, Mich. (WXYZ) — A shooting last month in Pontiac left residents scared and afraid to leave their homes. The shooting on Princeton Avenue was caught on multiple home surveillance cameras. Deputy Aaron Garcia, the U.S. Marshals DFAT supervisor, describes Nathaniel Covert as a "local Pontiac gang banger." "Covert pulls in the street right over here in this house – he gets out of the vehicle, he starts walking toward the victim over here – and the victim's trying to escape to the backyard," Garcia said. Two different homes' surveillance videos pieced together show the shooting, as neighbors join the fight to clean up their street. "Covert's arguing with him, he takes a shot at him from down the block in pretty good distance range, takes a shot at him, completely misses the victim and strikes an innocent victim's house who happened to be sitting in that chair- could have got shot and killed by his bad aim and bad judgment – he shoots at the house, misses him and the victim manages to escape," Garcia said. The bullet is still lodged in the side of the home while Covert hides from police. Garcia said his criminal history includes narcotics and weapons. Covert is 22 years old, 5 feet 5 inches tall and weights 145 pounds, with several distinct tattoos covering his body, including a dollar sign above his left eye and Chief Pontiac on his bicep – a branding of his hometown, where the Marshals say he will be found. "He’s still in this area, he’s gangbangin' in this area, he’s gonna be right here in Pontiac when we find him," Garcia said. 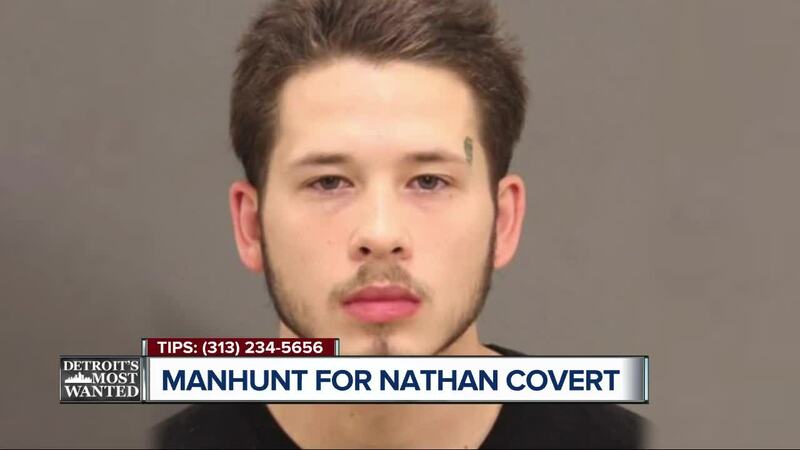 As always, there is a cash reward for any information leading to the arrest of Nathan Covert or any of Detroit's Most Wanted. You can call the U.S. Marshals anytime at 313-234-5656.